I've been blogging for 13 years (gasp!) and for most of this time I've been recommending Talbots. 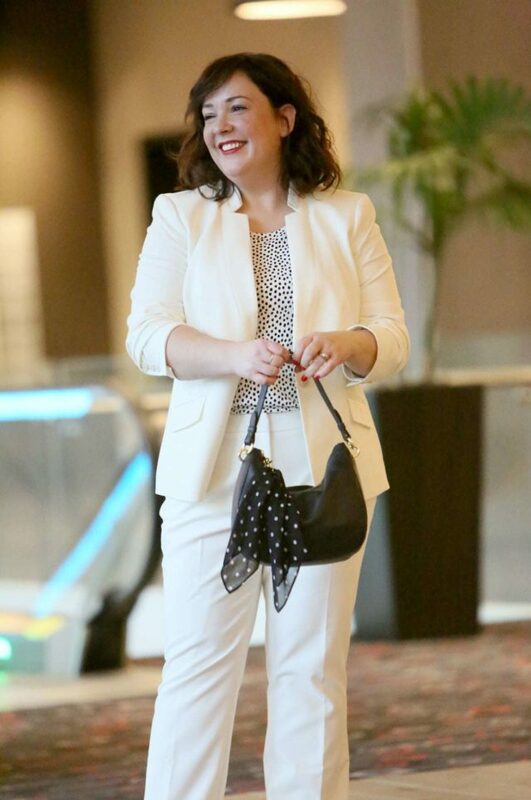 At age 29 and a size 10, age 42 and a size 16, and everything in between, I've relied on Talbots to offer quality, consistent sizing, and modern classic style that transcends each season's trends. I've always appreciated their extended size range, and how they're one of the few retailers (and one of the first) to offer petite sizing in plus sizes. After I had my daughter, I felt like a stranger in my body and had no idea how to dress it. I popped into the Talbots near my office on a lunch break and found a few wrap dresses that fit me, really flattered, and made nursing a breeze. I found pants that didn't dig and didn't drag on the ground. Post-baby I was no longer straight sized, but at 5'3″ I found plus size clothing too big. At Talbots I was comfortable and felt beautiful in their size 16WP. While many retailers over the years have given up on their plus size lines, hiding them in the back of their stores, offering them only online, or discontinuing them all together, Talbots has made strides in improving and increasing their Women and Women Petite offerings. Today many of you will receive a mailer from Talbots in your mailbox dedicated entirely to their new plus-size collection for March- a collection of modern classic style that focuses on a palette of brilliant blues, pops of brights and timeless black and white. What's exciting is that Talbots isn't resting on their laurels and maintaining their plus-size status quo. With this new spring collection, Talbots is hoping to help “break the myths” of plus-size dressing. Yes, we ALL can wear bold prints, rock horizontal stripes, we can tuck in our tops, belt a dress and look utterly amazing doing it. Talbots' spring plus size collection focuses on fabric, silhouettes, and fit that will make any women look good, feel good, express her unique personal style and possibly step outside her comfort zone. What I'm super psyched about is their Knit Jersey System of Style. It's like Talbots entered my brain and made my dream plus size capsule collection. There's even stripes in there and y'all know I love stripes! The shell I'm wearing under this suit is part of it, and the fabric is what I would make my own fantasy fashion line out of – a gorgeous matte jersey with just the right texture, weight, and drape that can be worn with a cardigan and jeans on the weekend, or with a sparkly necklace and heels to a cocktail party. Comfortable, machine washable, wrinkle-free, it's perfect for travel. These wardrobe basics come in classic colors (black, white, and navy) making them perfect staples from which to build a wardrobe. And how freaking awesome is it that this is a plus size-exclusive collection? I am thrilled that Talbots wishes to celebrate you, the Wardrobe Oxygen reader. One of you will win a $250 gift card to Talbots to update your wardrobe for spring! Beautiful jacket! I love this outfit, looks really fresh for spring. You look very professional. Love the purse. I love that Talbots will have a plus size exclusive collection for spring! Also love that I can shop there with both my straight size and plus size friends! I’m a sucker for a beautiful blazer! Pique Aberdeen Blazer immediately caught my eye…! I love love love Talbots, but have such a long torso that sometimes I have difficulty with their shirts hitting me the right spot. Difficulties of being tall and plus size I guess!!! The 14WP is such a rare, rare thing to find, but MAN does it fit me perfectly. I got a black suit from them for the first day of a new job, and I put it on and it fit right, with NO ALTERATIONS. That’s insane to me. I will buy just about any workwear from them — it’s nice to find someone who carries blazers and suits appropriate for the more formal DC offices. Would love to try out the knit jersey! I discovered Talbots women’s petite 12 years ago, and for the first time in my life, I had clothing choices! I finally found clothes that looked and felt good. No one I know carries this forgotten category. The pom pom pumps ! I really want those. Talbots has been hit and miss for me, but I’m excited about the knit jersey system! I also love these types of fabrics. Absolutely love Talbots – everything is so polished. The Crest Vibe Sperry® Sneakers are cute! LOVE the flounce sleeve tunic- so cute and fresh! I love Talbots. Their clothing always lasts far longer than other companies. I love Talbots! Great, quality pieces that last far longer than other companies. 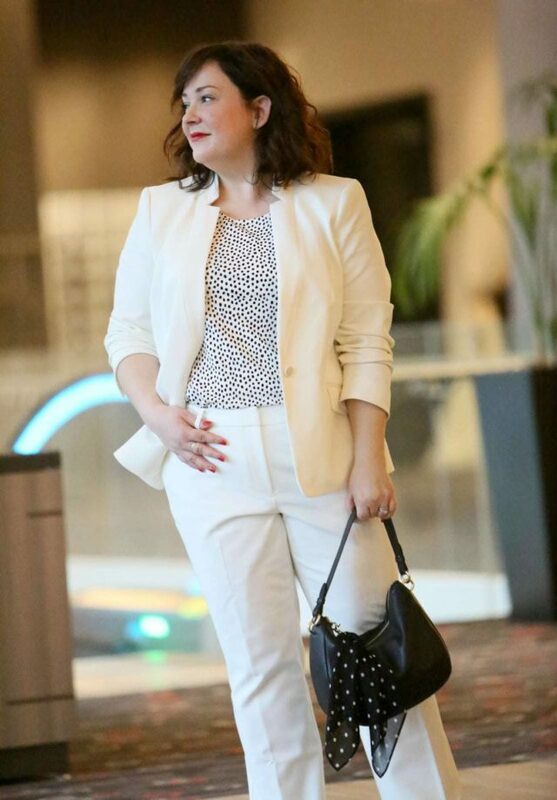 Love the ivory blazer but the style system totally fits my lifestyle! I love you stile, very nice! I think it has to be Talbot’s classic style and tailored look. It’s always in style! I love Talbots. Discovering women petites has changed my life for the better. I need to give Talbots a try. I like their feminine aesthetic, but found the price point higher than I could afford when I was younger. I’m now at a point where I want my clothes to last longer and will pay for quality, but they’ve just never hit my radar. I absolutely love your outfit – Talbots has really had some cute clothes over the past year+. I think it may be time to give them another shot! I’ve never purchased from Talbots but I’d love to try their plus jeggings. 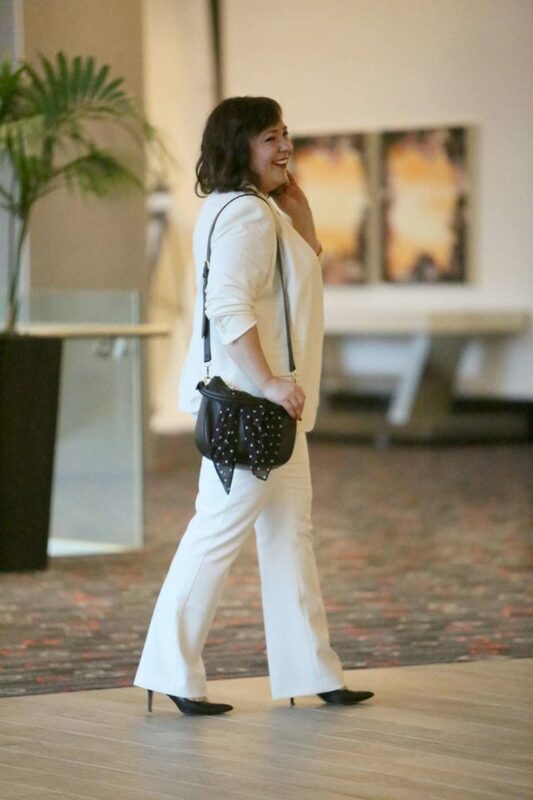 The Plus, Bi-stretch cotton pants are what I have been searching for. I think it has to be Talbot’s classic style and tailored look. It’s always in style!. And I have to agree with you Allison that over the years Talbot’s has always been my go to place no matter the size. I love the Perfect Shirt in polka dot, so adorbs! I want the suit you’re wearing!! Love Talbots cardigans. Yes, ALL of them. Talbots petite pants are the best fitting pants for my pear shape, so I am definitely digging the Chatham Crop pants with the scallop hem. So cute! The white slim jeans are great for spring. Love the color for spring! I’m petite also, I need to give Talbots a try! I love the lace stripe pencil skirt. Talbots is one of my favorite stores to shop at for their classic pieces! Also, their pants always fit me the best. The Flounce-Seeve Popover – Stripe is very nice! I am loving the new Isa Pom-Pom Pumps – Yarn-Dyed Stripe shoes! Wow – I love that more stores are starting to do capsules. Very stylish and practical. Love the dotted shell and the pleated hem top! I haven’t tried Talbots in 20 years! I’d love to try them again! I particularly like Talbots’ cashmere. ITalbots extended sizing is the best. You look great. Love your hair. I love Talbots. So much of my wardrobe is from there. I think you look great in this outfit. And while I am not Plus sized or petite, I so love brands who embrace women of all sizes and shapes. It shows that they value women and respect their customers. Your previous coverage of Talbot’s has had me browsing their website and this new collection looks like what I need for some pants and maybe a jacket to transition to spring! I love the bright colors in the spring collection! Spring tends to be my least favorite time for purchasing clothes because all of the pastels come out, which are the worst choice ever for my skin tone. I could see myself wearing a lot of this stuff! I like the Cotton Lace-Sleeve Popover and the Flounce-Seeve Popover – Stripe. Did you start dancing, ’cause it looked just like you needed to dance? Is that what Talbots does? As a mid 30s lawyer mama, Talbot’s is a godsend for me. Probably 90% of my work wardrobe is from there. I am loving the fringe tweed jacket. I am dying over that shirt. Definitely gonna pick one up. Ali, you are gorgeous in that suit! I typically think of you in bold or dark colors but this is beautiful as well. Talbots has been hit or miss with me over the years but in the past few years, I’ve really started to like them again. They’re doing a good job of staying classy while also keeping a modern/current vibe. Love the classic style and appreciate the petite-plus sizing options. The in-store customer service is top-notch as well. Yet another brand I never considered before your blog that is now a go-to! Talbots Blazers are my favorite- the only brand that fits. Love Talbots and I love that they have petite plus sizes. So nice to find skirts that are the perfect length. Ally, I love that suit so much; I bought it today. What other outfits are you recommending from the current Talbots catalogue? Thanks!! I could see myself wearing the Ruffle Stripe Skirt quite often. Talbots is a great place to shop for petite sizes. That suit fits like it was tailored for you! I wouldn’t mind one like it, maybe in another color since Iam not the neatest person! Their pants fit like a dream if–as you mentioned–you are curvy AND short! I would definitely buy more! Knit Jersey you say? Speakin’ my language! Way to go Talbots. I love the selection of petite plus! I haven’t loved every Talbots collection in the last few years but that suit is terrific! Love the outfit you are wearing! I haven’t shopped Talbot’s before, but seeing this easy black and white collection is making me want to check it out! I know I’d be able to easily coordinate these pieces with other more colorful parts of my wardrobe! You look absolutely amazing in this outfit from Talbots. The pants fit you so beautifully, and the jacket is such a pretty style. I just looked at coats on the Talbots website, and there are three totally different styles I’d love to to have: the red denim jacket, the green anotak, and the pink color-blocked raincoat. I like these pants so much I may get them in the other color too! Would love to try something from the knit jersey collection! I am also 5′ 3″ with a similar shape, so I frequently look to your blog to see what looks good. I have shopped Talbots since the 1980’s, and always find classics that stand the test of time. Talbots has been my favorite store for years now for many of the reasons you’ve mentioned. I’m very similar to your size and over the years I’ve gained and lost weight and I’ve found myself wearing (depending on the year and the piece) Talbots’ straight sized misses, straight sized petites, women’s petites, and regular women’s sizes. It’s great to know that whatever size I happen to be at the time, they’ll offer it. Talbots has always been one of my favorite stores for classic women’s clothing. You look classically fabulous! I have fit problems as I don’t seem to fit into any category of sizes. Guess I need to revisit Talbot’s. It’s been a while since I’ve shopped there. they’re worth a revisit. Their collections consistently improve with classic style but with touches of modernity. This blazer is a perfect example. It’s a classic suiting fabric and silhouette but the notched lapel makes it modern and chic! I have always loved Talbots modern classic style. I think the gorgeous model in this post is the biggest selling point. Gorgeous Alison. Aww thank you so much Denise! I really like Alison’s blazer in magenta. Oh, Talbots, if only you would extend your Women’s Petite sizing to include 24W and 26W! I wear a lot of 2x Talbots sweaters, but weirdly their numbered items are usually too small for me. 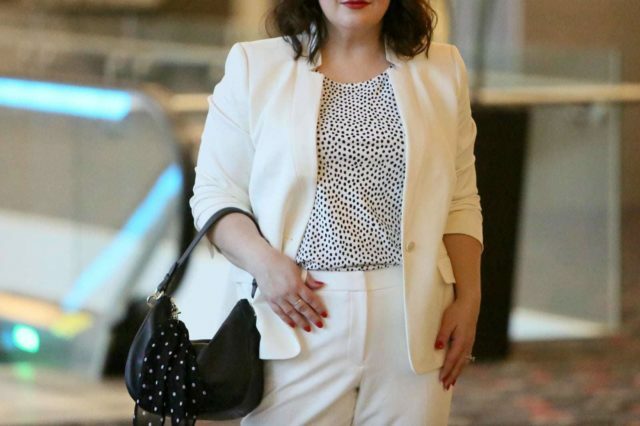 I’m really interested in their plus-size work wear – it’s so hard, for me at least, to find good-looking, well-made, classic work looks in plus sizes that aren’t prohibitively priced. I always forget about Talbots! That suit is amazing! First off, you’re looking great. Love that healthy glow. This suit is beautiful. I used to hate wearing suits because they never quite fit correctly. But this one is sharp! I’ve never shopped at Talbots before. I need to pop into a store one day soon. I love the Chambray-Trim Tweed Jacket! And also, that suit looks amazing on you! The polka dot pieces are really speaking to me. Reminds me of spring. Thanks for the giveaway! I LOVE Talbots! Though I confess I have learned to wait for sales – got some GREAT stuff that way, this winter. This white outfit looks great on you!! I have some Talbots dressy beaded belts and classic necklaces from the late ’80s. They look brand new ,and because I only use them a few times a year for formal events, I’ve never tired of them. Haven’t shopped at Talbots in many years. I’m going to have to give them a try soon. I rely on Talbots for the very reasons you mentioned. Would love to win this giveaway to fill gaps in my closet. Thanks! In the past I’ve felt that Talbots skewed a little older than me, even for work wear, but the styles in this new collection look like something I would like to try. I have always loved Talbot’s spring collections. THeir colors are clear and bright, not muddy. their clothes are always high quality, too. I need that poplin side-tie top in my Spring rotation 😉 And their suiting looks great. Love the look you are sporting. On a fun side note re Talbots … I packed poorly for a trip this past week and hit a second-hand shop to fill in the blanks. I bought a Talbots dress that likely was from the 80s (given the size of the shoulder pads). It was STILL in perfect shape. I wore it for an important work event and several women thought it was Eileen Fisher. Good stuff! As a professional who needs to wear suits or blazers every day I appreciate that Talbots carries plus sizes in stores! I am a major Talbots shopper. I love their plus size line. Especially love their new Oprah collection. LOVE this look! On my way to Talbots now! I love how they’ve updated their styles over the past few years. That striped top in the photo is tres Boden! OK, I had no idea Talbots had plus size! (welcome to living in rural Upstate NY, haha) I LOVE the blazer. I have a hard time finding ones that fit, so this is exciting! The suede driving shoes are lovely! The Braided-Stripe Bateau Tee appeals to me. I love your entire outfit and would like to try it on and see if I look half as amazing as you look! I’ve only recently discovered Talbot’s thanks to the Wardrobe Oxygen Facebook group. I’m in love and they are my new go-to for shopping. Thank you for all you do to promote self love, no matter your size! I always forget about Talbots when shopping. Thanks for reminding me why I should shop there more often! And love the suit on you…very flattering! Beautiful outfit! You look great! Thanks for offering another awesome giveaway ! This brand has stuck with me through every decade and every phase. Others have come and gone, but their clothes continue to fit and last. I can always find something! I love the look you’re sharing. I love their perfect crop, denim pencil skirt, and their sleeveless tops for casual office wear for the spring summer! I NEED the Edison D’Orsay Bow Flats in yellow in my life! Woo hoo! I LOVE talbots! 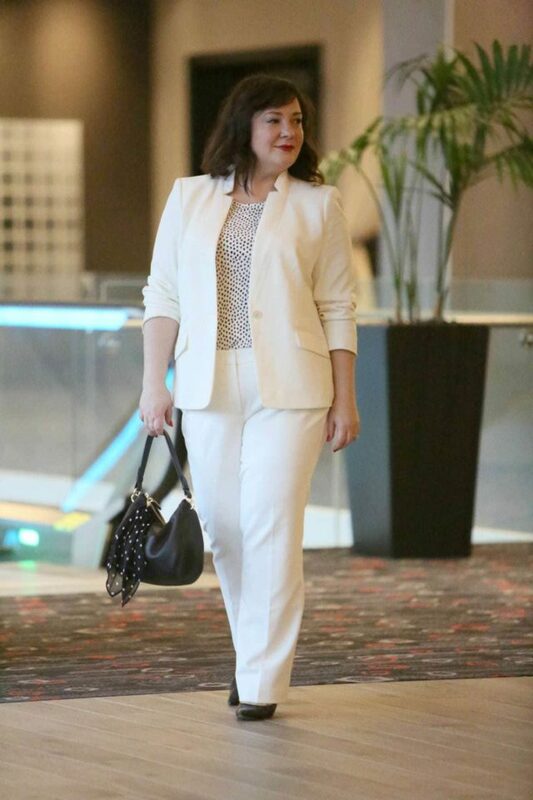 I love that they have plus size clothing that actually looks professional! Sometimes their stuff is a little girly/conservative/feminine for me, but I can always find classic basics that enhance my closet. Yippee for this giveaway!!! The last time I shopped Talbots was years ago and was too mature for my taste. Looks like Talbots is making the right design moves! I have to check them out again, as I’m definitely in need of suiting that fits! Talbot’s is an old standby – I like that you can sometimes match the plus and straight sized separates. After losing weight, I really need some updates for spring. What a great prize! i haven’t really tried Talbot’s much, but i’ve admired many pieces you’ve shown on your blog. i checked out their new arrivals, and I’m really digging all the denim options they offer — and for ALL sizes! They sent me these shoes too! Unfortunately the pants were a bit too long with them and I didn’t have time to tailor but expect to see these shoes on the blog in the future. They’re super cute! This outfit looks fantastic on you! And it’s the most perfect ivory – not too yellow, not too white. That suit is absolutely gorgeous! It looks fantastic on you. So many cute shoes! Love the striped block heels and the blue gingham flats especially. Oh my goodness, I need this one! I’m required to be in my office more often and my work wardrobe is sadly lacking. I’d love some jackets and pants to mix and match! I LOVE Talbots! I am writing a book where I have to interview people in very professional settings, Talbots has been my goto because they are attractive, polished and durable. This outfit is amazing! I love their new collection. That top looks great. I’m also eager to try some of their new shoes – there’s a black and white striped shoe with a pom pom that looks so fun. I like a lot of the black/white line, but also love the blue / yellow color story. There’s a cute t with sequin peacocks on it that just seems fun, and the butterfly sheath is gorgeous. There’s a crewneck sweater with a stripe (resort stripe?) that I have my eye on, and I saw in store this weekend a jersey shirt dress that I wish I had tried on. Basically, there’s a whole lot on my wish list right now from Talbots. I got those pom pom shoes, I loved them too! When I ordered this look I was envisioning wearing them but it was a touch too much and they are a shorter heel and I didn’t have time before the shoot to hem the pants. But expect to see them soon they’re super cute in person too! I love how Talbots takes classic styles and always makes them look modern with on-trend colors and prints. They always have fun sweaters, so my daughter and sister often get Talbots for Christmas! Love your outfit and I love Talbots! Love the striped tunic and sleeveless top. The whole collection intrigues me and I will have to try it out. You look amazing in the white!! Love all of the bright spring colors – my favorite is the v-neck sweater. Talbots is my go-to for dresses. Thanks for another great giveaway! I love matte jersey. That white suit looks great on you!! My wardrobe is built around Talbot’s Indigo! Love to add the embroidered jeans – so cute and perfectly workable for my work at home casual style! Big fan of Talbots, and like you, through several sizes over the years. This might be the best of this month’s giveaways! I just had my colors done and I’m told black and white is even better for me than straight black (Bright Winter here!) Would love to dive into this fab black-and-white collection. I can’t get over the little notches in that blazer collar. So simple and so sophisticated! I would definitely try a white suit if it fit me like it fits you!! I’ve been reading your blog for such a long time, Alison, though I rarely comment. This outfit looks smashing on you! It’s so becoming. I’ve shopped at Talbots for years and at many sizes. There are several items I like in the new arrivals: the Flower-Embroidered Denim Girlfriend jeans and the Ruffled Jean Jacket in yellow. My nicest and best fitting pieces are from Talbots. When I was just starting out my career, I used to order from them during sales and get things tailored to fit perfectly and every single thing I own from them is amazing quality. Their plus collection is fantastic! I’m sold just with that picture of the blue & white striped top in the advert. Can’t wait to feel the fabric in person. Me too, it looks awesome! I’ve been a Talbot’s fan for years and years – there are soooo many things I would love to have! I am in love with the notched collar blazer!! I love Talbots! Especially the petite plus pants. I am very interested in the Knit Jersey collection. The Fit and Flare Dress and the Twist front top would be perfect additions to my Talbots collection! The color block raincoat would be so fun for spring! I love that outfit! Perfect for so many occasions! I have always loved Talbots for style–you can purchase a piece today at Talbots and it will STILL look perfect in both quality and style ten year from now. My problem is that the few pieces I own from the store no longer fit post-babies. I’ve been at SAHM the past few years and am re-entering the world of full-time work this fall, so some new classic pieces in my new size would be perfect and likely last a long time!! I love the new Talbot’s catalog!! Oh wow. What a beautiful line of new arrivals. Hard to choose just one as they just kept getting better as I scrolled down. The embroidered fit and flare dress is gorgeous. Thank you for such a generous giveaway. I want to try their (gasp!) full length high waist bistretch pant. Very tired of ankle pants! I used to regularly buy their cotton bistretch pants an look forward to trying these. And curvy!!! Love Talbots ankle pants! I see they have them with a cute scallop now. I also love the Striated Denim Shift. This white suit looks great on you! It would be perfect for a conference I have coming up in the spring. right now i’m in need of advice on dressing one armed. just broke my right arm in mexico. now pinned and back home. very clumsy. remember you with this problem. Oh I am so sorry! I saved all my broken arm posts under one tag, you can find them at: https://www.wardrobeoxygen.com/tag/broken-arm I wish you the best and send me an email if you have any questions! I really need to look at their collections again! I like the classic, but relevent, feel – a great blazer/jacket can update a look quickly! Talbots is awesome for classic tailored clothing! Wearing a Talbot’s blazer right now! I love their blazers! They are both fun and professional at the same time. I can image wearing Pique Aberdeen Blazer and Notched-Collar Blazer (Magenta) for work, then go out in evening! This is a very sleek and professional look. Love it! Love love love Talbot’s!!! Their popover blouses are adorable – they can be tucked in, but they have a nice hem so they can be left out, too. I feel like they have overcome their formerly “matronly” vibe over the past decade, and have really fun, fantastic pieces. My mom used this expression whenever she noticed a well dressed woman: Miss Van Astorbuilt. I am applying that to you in this cream Talbot’s outfit plus the shoes, scarf, and purse. You look smashing. Wow! Wow! Wow! I love Talbots. Have been wearing for many years. My favorite of the new collection is the scallop edged skirt. I like the way that it falls right below the knee. the chatham crop pant with the scallops is aDORable! i want them! Love Talbots for its consistent quality and point of view, as well as size diversity. Something for everyone, but in a good way. I am not a plus sized woman but I feel everyone, no matter their shape/size, should have great quality options that make them feel fabulous. Kudos to Talbots for being a fore runner in that race. I like the d’Orsay flats and the Sabrina top! Worked part-time at Talbots for MANY years; loved that I could offer customers something in their size within the store. To your point, I didn’t have to point them online or to another “sister” store down the hallway. I am very excited about the notched blazer your are wearing! Would love it in navy. I love all the beautiful blues! The Paisley fit-and-flare dress is gorgeous, and the scalloped edge on the charming cardigan is such a pretty detail. I recently discovered talbots, as at 45 I always thought it was where my grandmother shopped. I am glad I joined her on one of shopping trips! The Bow-Front Shift – Solid is really cute. I love this outfit on you, Alison. The fit is perfect and it’s understated and elegant. I’ve never shopped at Talbots but I’ll have to take a look now. I have always loved Talbot’s. So glad their demographic has changed to pre-menopausal! Those pants are perfect! 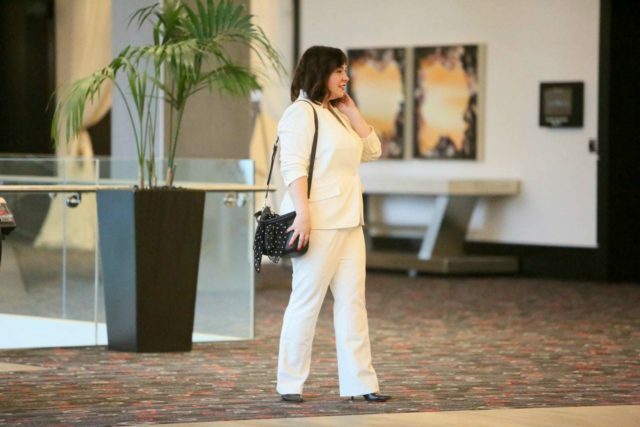 I’m not sure I’d wear white pants for my work environment, but they are stunning! Love Talbots! I also love the clearance store in Springfield! I’ve gotten some actual good deals. Love Talbots! I’m going to check out the new dresses and skirts! Never shopped with Talbots, so it would be great to add to my rotations! Lot Talbots knits because they wash like a dream! But the color blocked rain coat really caught my eye this time! Oh that is a fab suit! And the jersey collection is great; I find wovens hard to fit. my favorite store! thanks for posting. I heartily second your endorsement of Talbots. I’m actually wearing one of their sweaters from over five years ago. That’s how well it’s held up. And there’s a black jersey dress that I receive compliments on every summer. I appreciate that they don’t assume plus size women want crazy prints, ruffled, bedazzling, and such. I can always rely upon them for dressy clothes to attend weddings and special events that are seasonless. I have always loved Talbots! 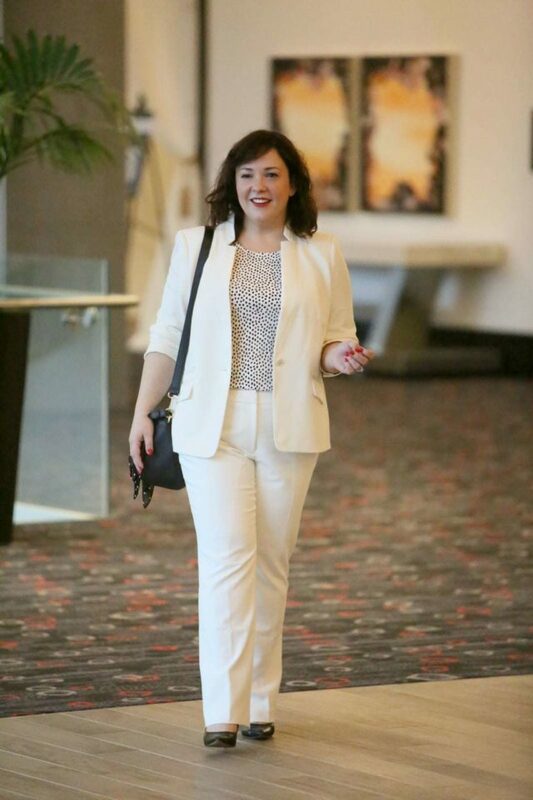 I am thinking I will buy an ivory suit for some special events this spring–fresh and nice change from the LBD i always wear! I wouldn’t have a work wardrobe without Talbots. As a (short) plus size woman in a professional office, a day doesn’t go by that I’m not in at least one Talbots piece (2 today). I also really appreciate that the dyes on their suiting is consistent so my navy wool skirt will match this year’s blazer cut, helping keep costs down while dressing for my job. ugh *dye lots are consistent (time for coffee). Love the blue floral flutter sleeve top!